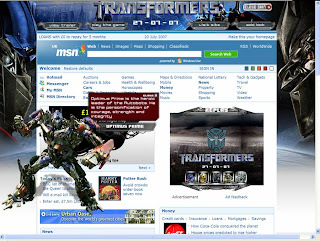 Transformers film takes over MSN home page! 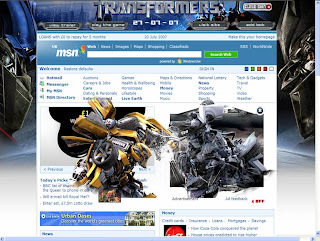 Another film using media very cleverly! 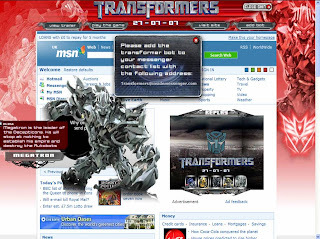 Today there is a homepage takeover on MSN to promote the cinema release of the new Transformers film and there are a number of things included in this that have not been done before. 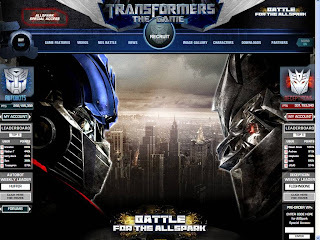 If you interact with the MPU (square ad to the right of the page) it allows you to re-skin the entire layout and get an introduction to some of the key characters. 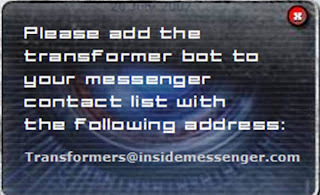 The header also allows you to watch the trailer, play a Transformers game and interact with the Messenger agent.